RED Electrical - Is your slate roof leaking? Like most other jobs, there are right ways and wrong ways to install solar panels. It the time of writing this page, the UK’s solar PV industry is six years old and poor quality installations are revealing their shortcomings. 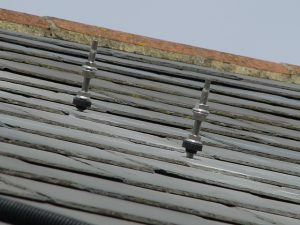 If you have solar panels and your slate roof is leaking in rain, it is very likely that your panels are fitted with an inappropriate type of mounting system. The low water absorbency and durability of slate, together with the ease of splitting into thin sheets, makes it a useful roofing material. Slates are fitted in overlapping rows, usually using two nails to fix each one to wooden battens. 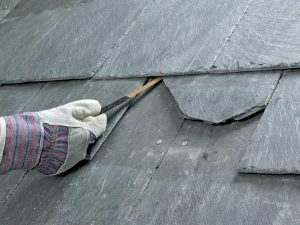 This method of fixing has been in use for centuries and there are many examples of slate roofs that are a century old and still watertight. From around the middle of the 20th century roofs also incorporate an underlayment of bituminous waterproof felt, or in more recent years, a breathable membrane. This is below the slates and provides a backup waterproofing layer for rain that gets in through broken slates or is driven up the roof in high winds. Solar installation should never take place onto an unfelted roof. Using nails to fix slates does present a maintenance problem; to remove them is quite a brutal process using a tool known as a ‘ripper’. This is inserted underneath a slate, hooked around the nail and hammered. This literally rips the nail out of the batten. Re-fixing slates requires straps or ‘tingles’, which can be made from lead, copper or nylon. Our favourite method of installation onto slate roofs is an in-roof system. The installation area is completely cleared of slates and the mounting system is laid directly onto the wooden battens. Flashings are fitted around the system and then slates overlap the flashings as they would do around a Velux or similar roof window. It’s a tried and trusted method that not only looks superior to other installation systems, but is also the lowest maintenance method as it leaves no slates hidden underneath the panels. Any future maintenance to the slate roof can therefore be carried out with the panels left in place. Secondly, there is the roof anchor. The majority of solar panel installations on slate roofs use this system. Slates are removed and a steel or aluminium anchor is fixed to the timber rafters. A lead, aluminium or plastic flashing is then fitted and the slates are ‘tingled’ back into place. The anchors are then fitted with aluminium rails onto which the solar panels are fixed. It is cheaper than an in-roof system, but does have the disadvantage of covering up large areas of slate so future maintenance is difficult. The third method is to use hanger bolts. A hanger bolt has a wood screw at one end and a machine thread on the other. They have a neoprene gasket over the machine thread and a nut that tightens onto it. They are actually designed for installing onto sheet metal roofs where the gasket will seal onto the metal sheet below. However, many cowboy firms have used hanger bolts (and still do) to fix to slate roofs as it can be done relatively quickly. This method is not compliant with any building codes. Hanger bolts can never guarantee a durable waterproof seal. These rogue companies know this, which is why they often use silicone sealants under the gasket to seal the system. It won’t last for ever, but will certainly not leak before your cheque has cleared! In addition, hanger bolts do not permit any movement of the slates due to thermal expansion, and the act of tightening down the sealing nut places stress on the slate, promoting future breakage. If you can see underneath your solar array, you’ll be able to check if it was installed using hanger bolts. You’ll see the bolts emerge through the middle of the slates. If your solar panels have been fitted correctly to a slate roof which has a layer of felt underneath the slates, it won’t leak. If the felt isn’t there or if hanger bolts have been used, then the installation will eventually let the rain in. Unfortunately in these cases the only solution is to repair the roof and re-install your system using compliant methods of installation. We remove the panels and mounting system and have the roof stripped, felted and battened by our trusted roofing contractors. We then fit the solar panels using the GSE in-roof system and our roofer slates around the installation. Be warned, the cost of this work will amount to several thousand pounds. It’s a lot of money, but it’s a permanent solution. Please note that we are only interested in permanent repair work and not temporary quick fixes, so if you are looking for someone to apply more silicone to the hanger bolts then that’s not a job for us.